Automotive Detailing reviews, tips, tricks, write ups and the latest industry news on all things autopian. Whether you are just starting detailing your own car or wanting to start a detailing business all the way to a seasoned professional, you'll find useful information in this blog. This blog is sponsored by DetailingGurus.com. Visit DetailingGurus.com for great detailing products at great prices! Duragloss TPP 105 Beading @ 5 Months! This is an application of Duragloss 105 sealant maintained with Duragloss Aquawax that is five months old. Today we are comparing two inexpensive wheel cleaner options. 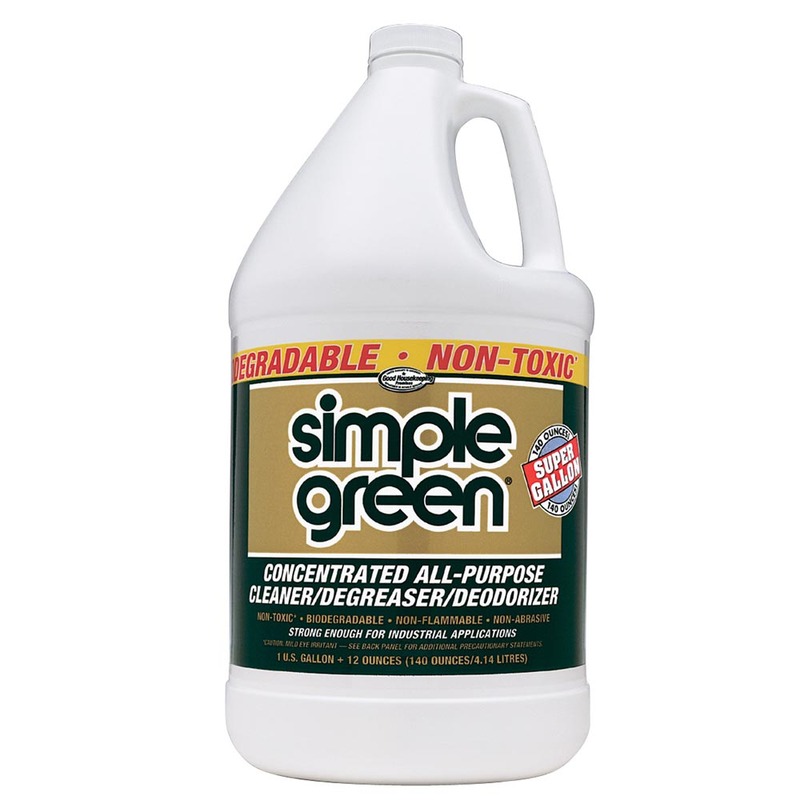 First up is perhaps the most widely used all purpose cleaner (APC), Simple Green. We tested it diluted 4:1. This is a popular dilution ratio for most APCs. This is the test wheel. We used a combination of a natural sponge and this all purpose brush to agitate the solution. While this was an effective cleaner for the outside of the wheel, it didn't seem to have the power to really clean the caked on brake dust on the insides. Next up was Dawn Power Disolve. This cleaner is available in the kitchen cleaning supplies in most stores. It is a very powerful cleaner designed for ovens. We tested this only in the rear area where the Simple Green APC seemed to be too weak to tackle the tough grit. You could immediately see that this cleaner was attacking the grime! The results were much improved! In our quest for a low-cost alternative to higher end foam cannons (foam applicators, foamers) we came across this unit made by Arrowline. At $15.24 it seemed like an attractive unit for the price! It was rated at 2,200 max. PSI and 5.5 GPM max flow rate. 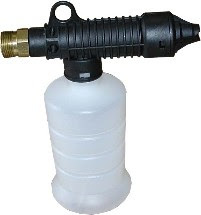 This was perfect for most medium duty, gas powered pressure washers. It used the standard 22mm twist connector so off we go with one of these on our Delta Honda powered 2,000 psi pressure washer. We picked it up from PWMall.com who had a pretty decent selection of pressure washer accessories including more expensive foam cannons. Total price out the door with standard ground shipping, $22.11. It arrived in less than a week. I tested it with Duragloss 902 car wash concentrate as this has been reported to be a good foaming agent in other models. We used a mixture of approximately 4:1 in this small container (looks like 12oz. bottle). The results were a bit disappointing. The foam was not a thick foam as you would expect from a pressure washer foam generator. It was more like spraying soap that you would expect out of a normal car wash bucket. The problem with this model is it seems to operate at the low pressure mode of the pressure washer. Perhaps if there was a way to modify it to generate higher pressure, the foam might be thicker. One of the purposes of a foamer such as this unit is to generate thick dwelling foam that can emulsify dirt away from the surface of the paint. It needs to be thick enough to be able to dwell for several minutes (4 - 5 minutes) so that all the dirt is lifted from the paint and into the foam. This foam barely lasted 30 seconds. I would say this was not an effective way to clean a car. We will continue to look for another alternative to produce the results we are looking for in the price range that is reasonable. I think less than $50 would be desireable. PWMall.com also carries this unit that may be close to our requirements. The listed price is $62.52. This model features a brass metering valve. Although slightly higher prices than our initial criteria, this still may be a better alternative. Wheels are one of the most important part of making a car look great! Here is a preview look at our 1999 Mustang Cobra test car with a new set of FR500 wheels. These are 18" diameter wheels with a new finish called Hypercoating. The fronts are 18 x 9 and the rears are 18 x 10. The front 9 inch tires are outfitted with 265/35 rubber and the rear has 295/35. Check back this week for a full photo shoot after a proper detail of the 99 Cobra. Check back soon for the full photo shoot as well as a write-up on tinting for this same vehicle.